I am guest posting over at Somewhat Simple today, with this little crinoline skirt tutorial! The crinoline is just darling. Such a cutie and the skirt is beautiful! On my way over to check out your guest post. I do have to say that you have my favorite blog. The colors, the set up, your beautiful family, there is nothing about this site I don't love! Thanks for the idea and tutorial! It is my new weekend project (even though I do not have a little girl of my own - God blessed us with two little boys!) You make such beautiful things, and you make them seem so easy! Keep up the wonderful work! I look forward to reading more! I've admired that skirt fabric for years... never knew what to do with it, though. Your skirt is precious! 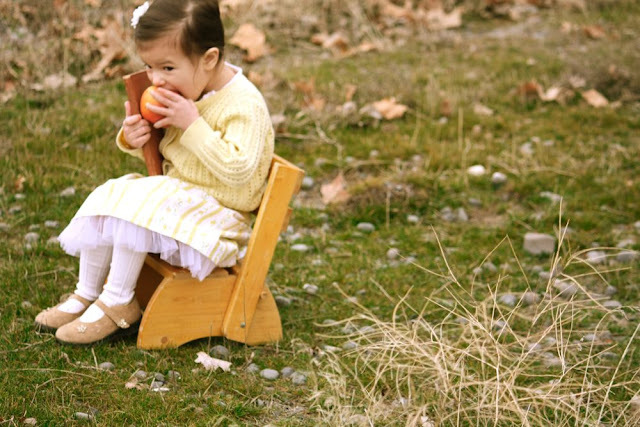 Your daughters's little yellow sweater is perfectly paired with this lovely skirt. Thanks for the tutorial. Hi! This skirt is absolutely adorable. I want to have one :D And your daughter is such a wonderful model! So adorable! I love the yellow and white, very innocent and fresh. Have a happy life with your family.. I saw over there! I loved your tutorial, this skirt is just adorable. Now i wish i had a little girl to make one for :) Thanks again for featuring me today! Have a Marvelous Valentine's day! Her shoes are on the right feet! I never understood that. There's a 50/50 chance kids will put them on the correct feet, but they always seem to end up on the wrong feet. Haha. oh you have really nice ideas ! Hi Disney--I'm one of your blogs most faithful stalkers from a little town in Idaho. I can't find this tute on the other page though? Did I miss it? IT's sooo cute and fun.